Some might say it’s a bit pretentious of a name for “Baked Scallops and Stir-fried veggies,” but a dish with class deserves such a description! Preheat oven to 400 F. In a 9″ round dish, add melted butter, and scallops that have been drained, rinsed, and patted dry between paper towels. Toss to combine, then distribute into one even layer. In a bowl, combine all the other ingredients and using a fork, mix well to combine. 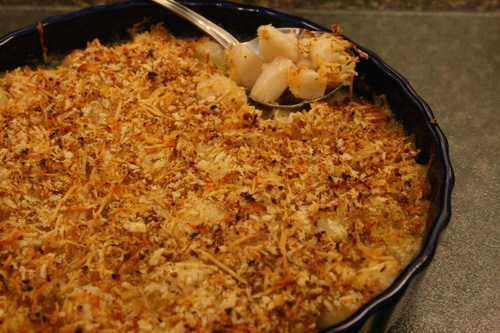 Layer this topping evenly over the scallop and butter mixture. 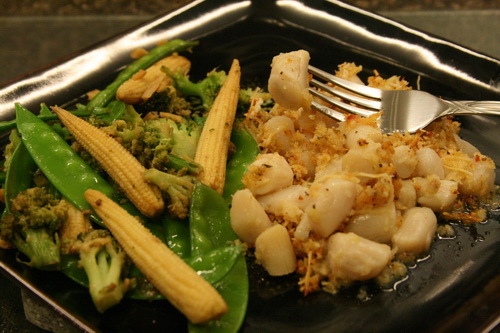 Bake until scallops are firm and opaque, about 25-30 minutes.